The ’70s are back in a big way for spring 2015, and that means lots and lots of suede accessories. From the runways to the NYC streets, we’re seeing fringe, platforms and now suede, all proof that the decade of long hair and general grooviness has resurrected in the fashion world. If suede conjures up images of heavy, boxy outerwear, think again: High-end designers like Gucci and Chloe, as well as fashion icons from Kate Bosworth to model Gigi Hadid, are styling suede in soft, feminine ways. Keep scrolling for the suede bags, sandals, boots and more that will inspire you this season. Chloe’s Spring 2015 collection offers suede-gone-Grecian with these stunning knee-high gladiators. By pairing her denim overalls with heeled sandals and a structured suede satchel, Kate Bosworth proves the ’70s can still look sleek. 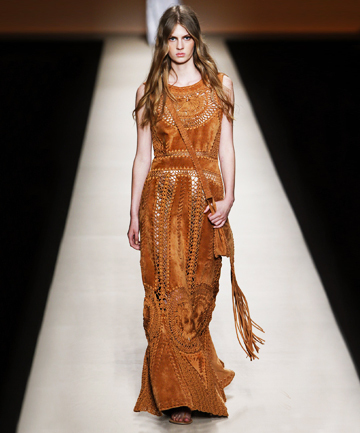 Alberta Ferretti’s floor-length vest personifies everything we love about free-spirited ’70s style. Dare to rock it? Ralph Lauren experiments with texture in this dichromatic look, pairing suede with knitwear. We particularly love the olive green pumps. Model Hailey Baldwin evokes Joni Mitchell in flowing florals, dream catcher earrings and, of course, a bohemian pair of knee-high suede boots. Not all suede is ’70s-inspired. Brazilian designer Pedro Lourenco contrasts the fabric with edgy metallics and geometric jewelry to create a fashion-forward vibe. Suede looks extra polished in the form of this classic, high-end handbag by Saint Laurent. Suede fringe was made for Coachella — as model Gigi Hadid proves with this festival-perfect vest. Copy her look for every day by layering this Ralph Lauren Fringed Leather Vest. Ferretti takes the trend to new levels with this intricate, all-suede ensemble. Not into head-to-toe suede? Stick with the crossbody bag.